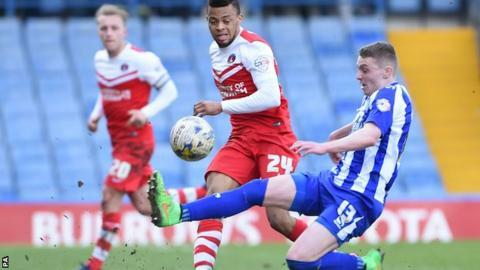 Sheffield Wednesday continued to struggle at home after Charlton fought back to secure a draw at Hillsborough. Chasing only their second home win in nine matches, Caolan Lavery put Wednesday ahead from Lewis Buxton's cross four minutes before half-time. Charlton were earlier denied the lead when Chris Eagles's shot was disallowed for offside. Eagles created the equaliser 15 minutes from time when his shot was parried for Johann Berg Gudmundsson to level. Wednesday were also indebted to goalkeeper Keiren Westwood, who blocked Simon Church's shot from only three yards out during the first half. But Wednesday could have scored a late winner after hitting the bar twice, firstly through Lavery's long-range effort and then when Lloyd Isgrove's overhead kick also hit the woodwork. Wednesday striker Atdhe Nuhiu perhaps missed the best chance in the final seconds when Buxton crossed into Charlton's area and he headed wide unmarked. "We had chances to get that second goal, but credit to Charlton because they stuck at it and got that equaliser. "It's disappointing because we've hit the woodwork twice. We just didn't have that bit of luck or that bit of a break, but the most important thing is getting that second goal which we didn't do. "You've got to keep creating chances and have that self-belief, that confidence, to say 'the next time that chance comes to me I'm going to put it away'." "I think in the first half we had a great chance to score. "We had great chances and also the goal that Eagles scored was onside, not offside, and if the referee had seen it it would have been a completely different game because we had the patience and the space to counter-attack in. "Sheffield Wednesday played better, with more tempo, but it is good that we know how to respond to this moment." Match ends, Sheffield Wednesday 1, Charlton Athletic 1. Second Half ends, Sheffield Wednesday 1, Charlton Athletic 1. Delay in match Kamil Zayatte (Sheffield Wednesday) because of an injury. Lloyd Isgrove (Sheffield Wednesday) wins a free kick on the left wing. Attempt blocked. Chris Maguire (Sheffield Wednesday) left footed shot from the right side of the box is blocked. Assisted by Lewis Buxton. Corner, Sheffield Wednesday. Conceded by Roger Johnson. Attempt saved. Sam Hutchinson (Sheffield Wednesday) header from the right side of the six yard box is saved in the bottom right corner. Assisted by Chris Maguire with a cross. Attempt missed. Atdhe Nuhiu (Sheffield Wednesday) header from very close range is close, but misses to the left. Assisted by Stevie May with a cross. Attempt blocked. Lloyd Isgrove (Sheffield Wednesday) header from the centre of the box is blocked. Assisted by Kieran Lee with a cross. Substitution, Charlton Athletic. Alou Diarra replaces Chris Eagles. Substitution, Sheffield Wednesday. Stevie May replaces Caolan Lavery. Hand ball by Lewis Buxton (Sheffield Wednesday). Lloyd Isgrove (Sheffield Wednesday) hits the bar with a left footed shot from the centre of the box. Caolan Lavery (Sheffield Wednesday) hits the right post with a right footed shot from outside the box. Goal! Sheffield Wednesday 1, Charlton Athletic 1. Johann Berg Gudmundsson (Charlton Athletic) left footed shot from the centre of the box to the top left corner. Attempt saved. Chris Eagles (Charlton Athletic) right footed shot from outside the box is saved in the bottom right corner. Assisted by Igor Vetokele. Substitution, Sheffield Wednesday. Atdhe Nuhiu replaces Sergiu Bus.